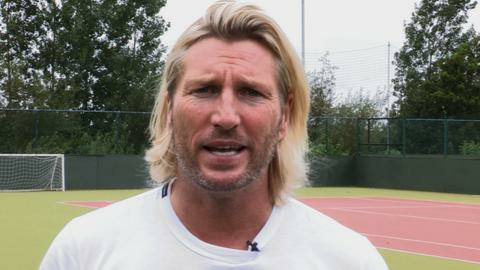 Former Wales midfielder Robbie Savage has called the side "a laughing stock" following their 6-1 defeat by Serbia. "I thought Wales were very, very poor and took you back to the days where you are a laughing stock," said Savage, capped 39 times by his country. "It's like we are going to places like Serbia, knowing we are going to get beat. "Against Belgium with 10 men on the pitch, they did OK, but going to Serbia and getting beat by six... it was embarrassing." The thumping defeat by a Serbia side that had scored only one goal in their previous four games leaves Wales without a point from their opening two qualifiers. Manager Chris Coleman is still looking for his first win in charge, but Savage, a former Wales midfielder turned BBC pundit, mounted a stern defence of the under-fire boss, insisting he is the "right man" for the job. "I think he is influential and I think he is technically very good," said Savage, who feels it is the players who bear ultimate responsibility for what happens on the pitch. "If you are not playing week-in, week-out for your club, it is difficult then to go and play at international level," he added. "I think Chris has to get his best players on the pitch and the players he picks have to be playing week-in, week-out. It is a difficult job for him." Savage does not believe Wales, who have scored one goal in five games, will qualify from Group A. But he says the future of Coleman, who has lost his first five games in charge, should not be in doubt just yet. "They have to judge Chris Coleman on his qualifying campaign," said Savage. "If Wales are at the bottom, or near the bottom, and miles off qualification, then you have to look at it. "Chris needs time. He has only been in the job for five games and it is laughable to question him now." Wales face Scotland in their next qualifier in Cardiff on 12 October, a game Savage describes as "huge". "For Chris's own piece of mind, for the country's piece of mind, they have to get a win," said Savage. "It is a six-pointer."